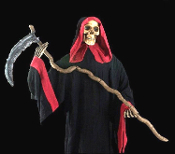 Ghost of Christmas Past or Future for your own Christmas Carol scene or Nightmare Before Christmas theater play scenery... this dimensional stand-up Halloween haunt prop decoration dressed in red-hooded black robe and wielding a massive sickle scythe with 14-inch blade. NEW detailed standing dead body is certain to send chills up your spine! Aged skull with moveable jaw face is ultra-real and poseable arms span 50-inch, all combine to create a grim reaper that has it all! Measures 16-inch wide at shoulders and comes with hangtag. Sickle measures 44-inch long and secures with nylon ropes. Standing on 12-inch x 12-inch durable black plastic base sturdy stand support.